We’d love your help. Let us know what’s wrong with this preview of To Be Told by Dan B. Allender. It is your privilege to listen to your own story so you can live boldly for the sake of Would you willingly overlook clear direction from God that speaks directly to you and where you are in life right now? It is your privilege to listen to your own story so you can live boldly for the sake of the Greatest Story, the good news of Jesus Christ. God reveals himself to you–and to others–through the story he has written in your life. In this insightful and compelling book, Dr. Dan B. Allender shows you how to read the stories of your life. He helps you understand the meaning that God has written into every detail of who you are. As a result, you can share your story with others and listen to their story, revealing unique aspects of God’s hand at work. To ask other readers questions about To Be Told, please sign up. I am inspired to dream beyond the limitations mankind has set upon me. Embrace risk and embark on a great and holy adventure. Jesus came to give us a full life. He left each of us with certain gifts in unequal measures. What will you do with the weight of glory entrusted to you? Will you hide it or invest wisely the talents bestowed to you? Dan Allender has written an excellent and inspiring book on knowing, understanding and embracing the story God is writing of your life, based on the theme of the circumstances He has uniquely and purposefully allowed into your life. Illustrated with powerful stories from the lives of others, it assures you of God's goodness, healing power and transformation in your own life as you come to know, share and even co-author your own story. Dan Allender has a positive gift for tearing me apart with words. Read his books. This one in particular jolted me between excitement, passion, elation, terror, shame, embarrassment, and nearly everything else in between. Allender forced me to confront my own life in a way I've never had to before: honestly, sympathetically, critically, and redemptively. His gentle encouragement and piercing words did more to wreck my preconceived notions about myself than any other book I've read. I'm still proce Dan Allender has a positive gift for tearing me apart with words. Read his books. I was supposed to read this book a couple of weeks ago for an assignment for some education I’m taking. Unfortunately, I didn’t read the syllabus correctly and submitted the assignment having not read the book. Oops! When I learned this earlier this week, I quickly downloaded the book (Kobo) and committed to read it over the weekend. It took me about 3.5 hours all said. It’s a very good book, and written very much from a Christian perspective. It speaks to the power of our story and how we can s I was supposed to read this book a couple of weeks ago for an assignment for some education I’m taking. Unfortunately, I didn’t read the syllabus correctly and submitted the assignment having not read the book. Oops! When I learned this earlier this week, I quickly downloaded the book (Kobo) and committed to read it over the weekend. It took me about 3.5 hours all said. It’s a very good book, and written very much from a Christian perspective. It speaks to the power of our story and how we can sort through it, reflect on it, churn about it, and write it out. And the author is repetitive and passionate about our story and God’s story and other people’s stories are all intertwined. This book is a great review of your past, with an eye to how it shapes your future, Dan Allender is an excellent story teller and encourager for you. Our group of 20, with probably 12 attending each week has found it to be a good stimulator of conversation in small group, as well as helping us explore our past and the hurtful times. There is a workbook available also all though it is more expensive. I would not buy it unless you wanted to learn to journal and refine your writing. This book has moved me on a journey toward understanding. An understanding I think I've always known, but have been too intimidated to experience. Our stories are powerful, and it is in the telling that we find the unmistakeable work of God in our lives. A reminder that we are not to keep our lamp under a basket, but instead hold it high to light and know our path. This book was really helpful in being able to look back on my life and clearly identify connections between certain events and how they are affecting me now. In turn, I'm able to better understand and work through them with the Lord. I'd read this book a few years ago but as with many books, I found myself understanding things more deeply and in different ways this round. I came away with a newfound desire to be involved with story telling and the healing it brings. We all ache for someone to know our story. We are called to be a safe place to hold others life stories with love and honor as well as our own . This book pierced my heart. I want to tell my story and I want to hear yours. The information in this book should have been a blog or magazine article. It did not warrant an entire book. Absolutely loved this book. It taught me a lot about understanding my own story and beginning to write it. Such a deep and interesting book and would highly suggest to everyone. Oh, books -- I just can't quit you. Usually. It's very seldom that I stop reading a book before finished, but I did with this one. I was more than halfway through, to note. Not to entirely lump this read in with them by any means, but as with a lot of self-help-y Christian books, To Be Told just gets repetitive, with a side dish of "I know you wish to inspire, but I've heard it all before." Dan Allender's story of recovery from abuses and addictions in his own life to become a leading spiritually- Oh, books -- I just can't quit you. Usually. Dan Allender's story of recovery from abuses and addictions in his own life to become a leading spiritually-minded psychologist and counselor is a captivating one to an extent, sure. His writing is just a bit bland, though sometimes vivid and engrossing, especially in links or metaphors or analogies he makes (ever the therapist). I think this could've been a better long-form magazine article or essay or journal article rather than an all-out *book*. It's a bad sign when what I look forward to most about a next chapter is the quote from a trusted, revered other writer that will start it. Shew. Allender does read and quote from some of the best, be it the psalmist or The Velveteen Rabbit. "Why must holy places be dark places?" "God acts in history and in your and my brief histories not as a puppeteer who sets the scene and works the strings but rather as the great director who no matter what role fate casts us in conveys to us somehow from the wings, if we have our eyes, ears, hearts open and sometimes even if we don't, how we can play those roles in a way to enrich and ennoble and hallow the whole vast drama of things including our own small but crucial parts in it." 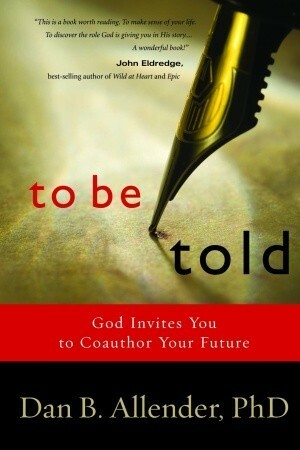 As a writer and counseling student this book resonated deeply with me. Seeing one's life in terms of story and compelling that story forward. This is worth a second reading as there are so many gems here. Allender is one of my favorite authors, and his "To Be Told" illustrates why I enjoy reading his work. Not only does he master the language, he writes with such fluidity and color he draws you into his subject matter, that is, writing your personal story. This is not an invitation to write a simple autobiography, rather a chance to dig deeper into details which have framed your life. Allender asks "What if we were to embrace with wonder every person who has spoken our name and written our story-- Allender is one of my favorite authors, and his "To Be Told" illustrates why I enjoy reading his work. Not only does he master the language, he writes with such fluidity and color he draws you into his subject matter, that is, writing your personal story. This is not an invitation to write a simple autobiography, rather a chance to dig deeper into details which have framed your life. This book seemed to speak to my soul. It is as if I could have written big portions of it and the rest were the missing chapters. I am super challenged to pursue my own story anew. I didn't really care for the part of trying to convince me of how God repents but I also could see his point. I also wish the book had more directives on how to work out the concepts he is asking of his readers as opposed to selling a workbook companion that I can buy digitally. If it did it would have had five stars. While the overall concept of reading your life as a story that has characters, plot, drama etc., is intriguing and helpful, this book fell short for me. It does have several profound moments but overall I didn't appreciate Allender's writing style. The book did however work well for creating discussion--I lead a small group of friends through this book this summer and if it weren't for our lively discussions I probably would have stopped reading this. Great book about the importance of each of our stories. Ironically, it's probably over-told, and I felt it could have been done just as well in half as many word. Unlike many things I've read, though, the central ideas are with me permanently and I am a safer person to others for having read it. Allender knows a thing or two about healing and honouring the person we are and the stories we have lived. Allender reminds me a lot of Eldredge. Both men are passionate about stories and people discovering and living out their own story. i would like to share more of my own life stories, as well as ask others their stories. Stories of rescue or God's provision. Stories of burning bushes or God's silence. i want to be more intentional in storytelling.